Winnie asked me recently whether I take my DSLR to work every day. I do not. Nearly all of my weekday lunch photos emerge from my little pink point-and-shoot. The only time I have the DSLR is when I am going somewhere fun directly after work that I want to capture. Today was one of those days with after-work-fun plans, so I was armed with the DSLR. Lucky for you, I actually went somewhere lovelier than usual for lunch. 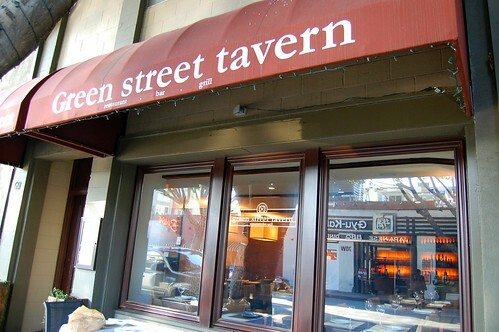 Green Street Tavern is a blink-and-you'll-miss-it kind of place. 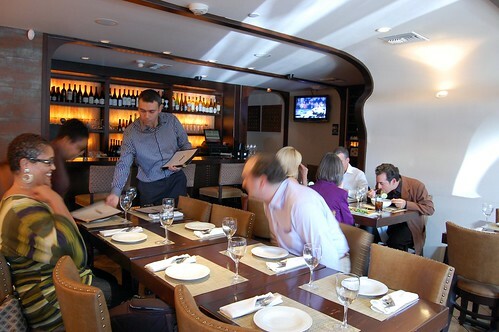 The space is totally tiny and emits an aura of modernity and masculinity. I'd been here once for dinner and enjoyed it greatly. Sadly, I didn't have a camera during that meal. It was amazing. Today's lunch, while rather appetizing, wasn't amazing. But amazing is difficult to achieve. I still recommend this restaurant for its fresh ingredients, innovative presentation, and cordial and attentive service. I urge you to go to dinner. Lunch, however, certainly yields better photos. Gotta love the light. 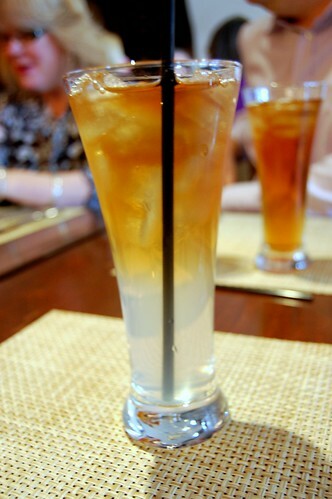 Our server constantly filled my Arnold Palmer. To say I drank something like six of these is no exaggeration. Nice. I started with the bleu cheese walnut tart with port wine figs ($9). Warm buttery flakiness hugged the rich filling, which paired very well with the sweet fruit. Ignore that the tops are a tad burnt. Get this. You won't regret it. My panini was stuffed with a duo of duck (smoked breast and confit leg) caramelized onions, roasted plums, and manchego cheese ($15). 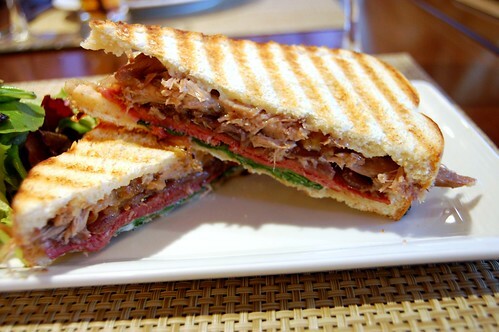 Tasty sandwich. The accompanying truffle oil fries outshone my main course, though. Big yum. While I didn't photograph my colleagues' entrees, by the end of the meal, I felt bold enough to snap some shots of their desserts. Aside from Wienerdude, this wasn't my usual lunch crew, so I had some initial hesitation. But, when the sweets came out, I was ready to rock. 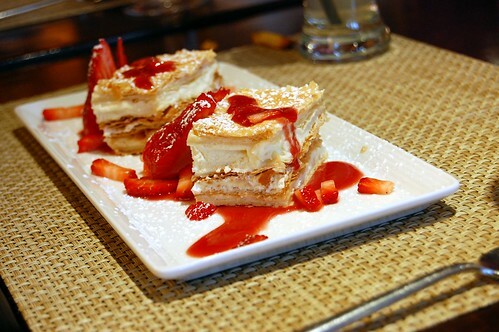 Napoleon with fresh strawberries. Light and airy. Mmm. 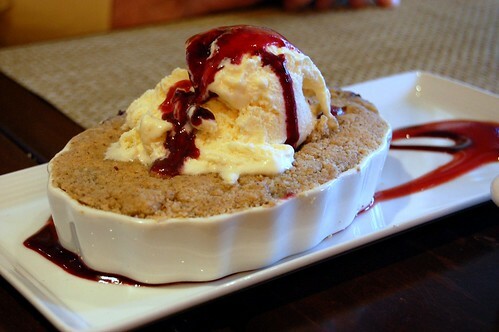 Hot berry cobbler. Tangy and crumbly. Mmm. And my awesome warm white chocolate croissant bread pudding. "Mmm" doesn't cut it with this one. Sinfully delicious. This one you must order. Must. No question this was my favorite part of the meal. I love bread pudding like you wouldn't believe. love. it's a little sick. You take really good pictures with your point-and-shoot then :) I am impressed. 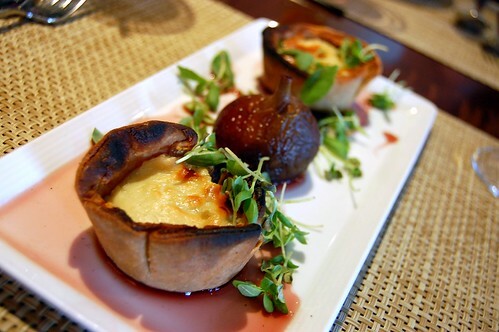 Your blue cheese tart starter looks divine! I need to find some truffle oil. their spinach and cheese omlette is fantastic. and the complimentary zucchini bread?! out of this world delish! 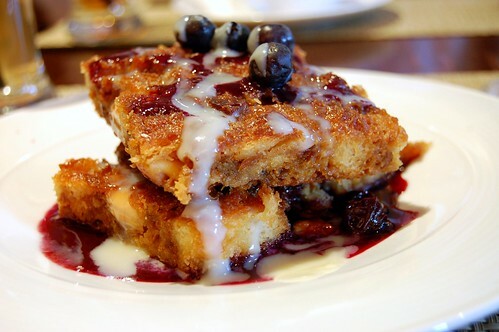 the bread pudding looks divine. that looks way better than my homemade bread pudding. I love that everyone you eat lunch with orders dessert too! It's so blink-and-you'll-miss-it that I have never noticed it all the times I've gone to my salon just down a block on DeLacey. Now I know where I'm headed for my next post-haircut lunch. Those desserts look a-m-a-z-i-n-g. I am jealous. I want to marry that bread pudding. 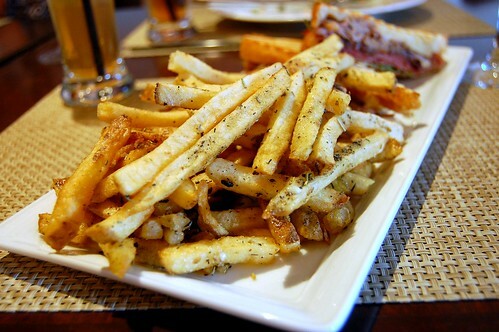 I love truffle fries. There's a great bar here that does either fries or tots with your choice of seasoning: regular, truffle (with parm cheese), fennel, togarashi. Mmmmmm! The best burger there is called the rooster, and the beef is made with sri racha, then it has a chili aioli, pepper jack cheese, and bread and butter pickles. heaven! I keep trying to leave you a comment...hopefully one of them comes through. 1. That napoleon looks so good, as does the bread pudding. 2. There's a bar here that makes the best burgers and fries. My fave is called the Rooster, and the beef is made with sri racha sauce, then topped with pepper jack cheese (i think), bread and butter pickles, chili aioli....mmmm. They also make truffle fries or tots with parmesan cheese, fennel or togarashi spiced fries or tots. So good. Sooooo good. huh. those pictures do look better.